Bernard Hinault had won the Tour and the Vuelta but the only Frenchman to have won the Giro was Jacques Anquetil. Hinault found himself fighting the combined efforts of the Italian riders. The solution was magnificent set-piece in the 20th stage. He sent his strongest gregario, Jean-René Bernaudeau, ahead and on the Stelvio Pass, joined him. The two distanced the pack enough to give Hinault the lead for good. Bernard Hinault had won the Tour twice and the Vuelta once but the Giro remained unconquered. Before him only Anquetil, Merckx and Gimondi had won all three Grand Tours and Anquetil remained the only French Giro winner. In the spring of 1980, Hinault, nicknamed “The Badger”, was in excellent form, having already won Liège–Bastogne–Liège and the Tour of Romandie. He was on track for another remarkable year, and for Hinault, unquestionably the finest rider alive at the time, the Giro was his to lose. Not accepting that proposition were Saronni and Moser. Moser was the reigning World Road Champion and, by 1980, the winner of countless single-day as well as several shorter stage races. Also, his spring had been superb, with victories in Paris–Roubaix and Tirreno–Adriatico. But so far the big guy hadn’t been able to translate his remarkable cycling talent into a Grand Tour win. The other force to be reckoned with was climber Wladimiro Panizza. For a decade he had consistently placed in the top ten in the Tour and Giro, making it all the way to fourth once in each of them. Other contenders included Giovanni Battaglin, Tommy Prim and Giambattista Baronchelli. The 1980 route was a perfect tough-guy race course. There were two hard mountaintop finishes and two others ending at less-severe hilltops. The Stelvio was defanged a bit by having the finish come well after the descent, in Sondrio. With 93.4 kilometers of time trialing, the pure climbers must have looked at the route map and shuddered. This was a race for a complete racer, one who could do it all. The race opened in Genoa with a 7-kilometer prologue. Moser was the fastest rider on the port city’s wet, slippery streets, taking chances as he aggressively raced over the flat course. Hinault rode his specialty time trial bike with care, conceding six seconds to Moser in the interest of avoiding a crash. Saronni’s sprinting legs were ready to race. He won the first three road stages, all in mass romps. While they were competing on the road, Saronni and Moser also fought a verbal battle in the press accusing each other of nothing of any particular importance, making an excellent polemica. Again the weather turned wet in time for a time trial. Jørgen Marcussen, one of Battaglin’s gregari, won the stage five time trial in Pisa. But Hinault, at second, performed a vivisection on the rest of the contenders over the flat, 36-kilometer route finishing in Pisa. Hinault was now in pink. The next day Moser announced that he and Saronni should ally themselves against Hinault. The surprise isn’t that riders would join forces against a dangerous rider, especially a powerful foreigner. Moser’s request was odd in that it was made so openly. After a day of racing on the island of Elba, stage seven headed south to Umbria with a finish in ancient Orvieto. As the peloton raced over the Apennines, all the contenders took turns attacking Hinault. Having brought a weak team to Italy, Hinault was forced to do a lot of the neutralizing himself. He made sure Saronni and Moser were in sight or behind him the entire stage. Eventually a break with Visentini, Panizza and Battaglin got away, beating the Hinault group by 3 minutes 14 seconds. Visentini took over the lead and Hinault was now eighth, almost three minutes back. There were several able men sitting between Hinault and the maglia rosa, yet Hinault swore that even with the Italians combining against him, he would triumph in Milan. The next day’s stage ending in Fiuggi showed that Hinault would have to dig deep if he wanted to defend himself against the combined efforts of the Italian riders. Six of his gregari were unable to finish with the leading group, the only rider on his team who had the strength to help him when the peloton was under severe stress was Jean-René Bernaudeau. As the race headed for Italy’s instep with a hilltop finish in Campotenese, the façade of Italian unity against Hinault broke down and the Giro became a more open race. During this eleventh stage, a dangerous escape that included Baronchelli and Panizza scared the contenders enough to work together, the break being caught just at the line, resulting in no significant changes to the standings. The next day’s racing was complicated enough to require a book of its own to tell the story completely. Halfway through the stage, as a result of an intermediate sprint, a break formed containing most of the big guns, but lacking race leader Visentini as well as Contini and Prim. Hoping to extract more than a pound of flesh from the three important missing riders, the break got itself organized and started motoring down the road. Contini buried himself and was able to claw his way up to the front group, but Saronni punctured. The sympathetic judges let one of the cars in the caravan motorpace Saronni back up to the peloton. 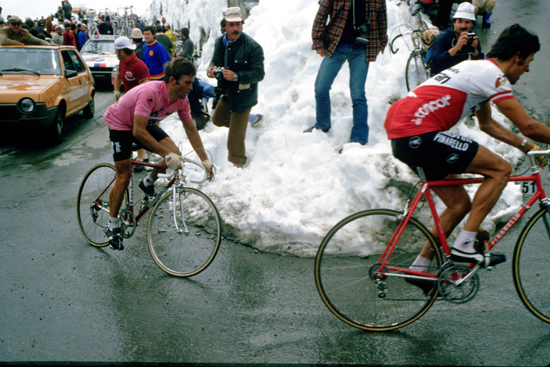 Visentini and Prim finally made it up to the hard-charging Moser/Hinault break before the stage ended. Contini crashed just 200 meters before the one-kilometer-to-go sign, meaning he would have to accept the time loss. The judges did some re-measuring and amazingly found that the sign had been placed 200 meters too close to the finish, allowing Contini to get the same time as the Moser/Hinault group and thus keep his second place in the General Classification. Finishing with the pack, Saronni lost 1 minute 16 seconds, dimming any hope of his gaining the maglia rosa. During stage fourteen, Hinault decided to assert his sovereignty over the others. The stage had several major climbs including the final ascent to Roccaraso. Bernaudeau was sent off on the second climb, the Macerone. A racer of his ability could not be ignored, so the peloton was shredded trying to bring back the fast-moving Frenchman. After sitting in on the chase for a while, Hinault blasted off and only nine riders made it to the top of the Macerone with him. On the penultimate climb, the Rionero Sannitico, Hinault again hit hard and by the top he had Moser, Saronni, Prim, Baronchelli and Panizza for company. As the small lead group climbed to Roccaraso, Hinault was generous enough in handing out pain that all were dropped but Panizza. 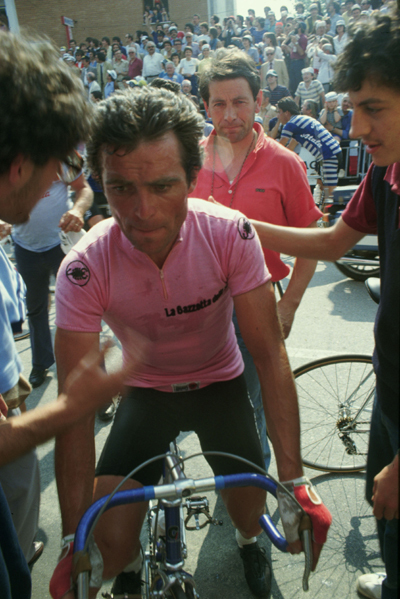 Hinault took the stage, and the surprising Panizza, a member of Saronni’s Gis team, found himself in pink. The day was a disaster for Visentini and Contini who both lost over lost six minutes. The standings stayed just that way during the flat stages that took the Giro to Sirmione, a city on a spit of land that protrudes about four kilometers into Lake Garda. 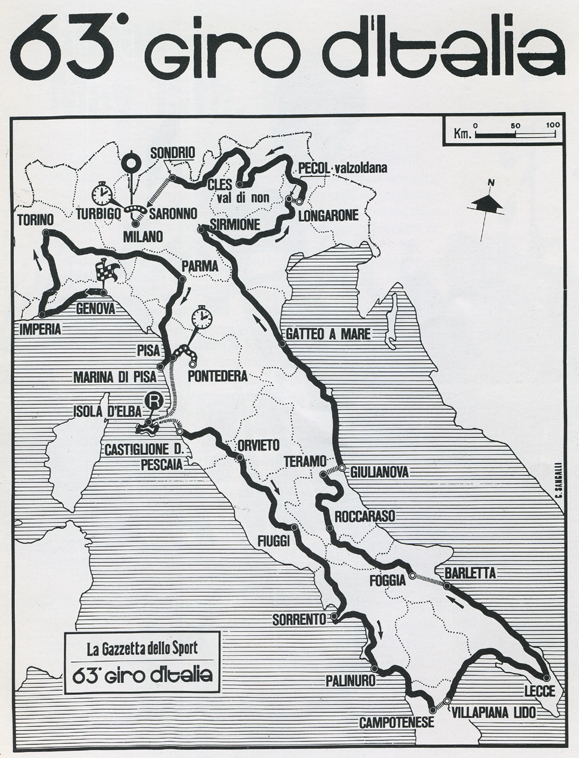 Next came the stages that would decide the Giro. Stage eighteen was the first, going over the Duran and landing at Pecól in the Val Zoldana. Part way up the Duran, Battaglin did a testing attack to see what sort of stuff the others were made of. Whatever it was, it was not the stuff of chasers. With no one along for company, Battaglin decided to continue, the others probably thinking it was too early in the hilly, 239-kilometer stage to make a successful move. He maintained his lead on the descent and managed to grow it to a minute as he continued to Pecól. Back in the peloton, everyone seemed frozen, afraid working might help a rival. Prim and then Panizza finally decided to bring back the fleeing and dangerous Battaglin, but it was too little, too late. Battaglin won the stage by 1 minute 15 seconds over Panizza and had done himself a world of good, moving up to third place at 1 minute 25 seconds. It was a magnificent ride. The day’s hard racing ruined the hopes for two more contenders. Rupérez, exhausted after winning the Vuelta a few weeks earlier, struggled in eight and a half minutes after Battaglin. Moser, who had been looking tired during the last few stages, lost 2 minutes 34 seconds to Panizza. He announced his intention to quit the Giro and rest up for the coming Tour in July. Neither Moser nor his team were in Frankfurt for the Tour’s start in July. Even though Battaglin tried his disappearing act again the next day with the Tre Croci and Mendola passes, the pack finished together. Status quo ante bellum. Hinault’s director Cyrille Guimard had planned his set-piece assault on the Giro for the twentieth stage with the Passo Palade followed by an ascent of the north face of the Stelvio. The pack went over the Palade together. At Merano, 50 kilometers east of the start of the Stelvio climb, several riders escaped after an intermediate sprint, three of them from Hinault’s Renault team. Why the pack let them go when everyone had to know Guimard would try something is a mystery, but escape they did and it was game on. At Spondigna the route turned left for the road that would become the Stelvio pass. The break was still away, now by six and a half minutes. The Stelvio climb proper is generally considered to start at Prato allo Stelvio and here Bernaudeau was able to ride away from the others in the break. Back in the pack, Hinault was chasing down any escape attempts, keeping things together. The six-man break, less Bernaudeau, was soon caught by the fast moving peloton. When his group arrived at Prato allo Stelvio, Hinault just about ripped the bars out of the stem in an attack that dropped everyone but Panizza, Prim and Battaglin. As the four raced up the mountain, Hinault put in three more hard attacks. The third was more than Prim and Battaglin could take, but pink-clad Panizza, 37 and in the twilight of his career, hung on like grim death. Again, Hinault was out of the saddle attacking the maglia rosa. The last hammer blow was too much for even Panizza, and Hinault took off to catch Bernaudeau, now only three minutes up the pass. The catch was made and they raced for the finish. Stelvio stages that don’t end at the top usually finish in Bormio, the city at the bottom of the south face. Not this time: the French pair had to ride about 80 kilometers further to Sondrio. The Renault riders did a two-man time trial and extended their lead with every pedal stroke, arriving in Sondrio four and a half minutes before Panizza, Prim, Baronchelli and Battaglin. Hinault let Bernaudeau take the stage while Hinault took the lead. With only a time trial in the way of Hinault’s march to victory, it looked like Guimard’s guidance had allowed Hinault to use his strength to maximum advantage. The 50.4-kilometer time trial at Saronno on the outskirts of Milan was the penultimate stage and the last one that could affect the outcome. Normally Hinault was almost unbeatable in a time trial and he was certainly superior to any of the riders close to him in the General Classification. Hinault didn’t win the time trial. But he didn’t have to. Saronni, Gregor Braun and Knut Knudsen were the day’s podium while those high in the standings lost still more time to the Badger. Hinault had planned to make 1980 the year of his Giro/Tour double. As the Tour progressed he began to suffer terrible knee pain and after stage twelve, abandoned, allowing Joop Zoetemelk to win the Tour on his tenth attempt. Hinault recovered from his bout of tendinitis in time to win the World Road Championship that fall.